It’s that time of year when we all crave pure comfort food on a chilly night. 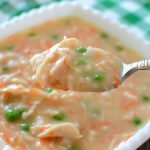 This is not the first chicken and rice soup recipe I’ve shared here, or even the first chicken soup recipe I’ve shared. 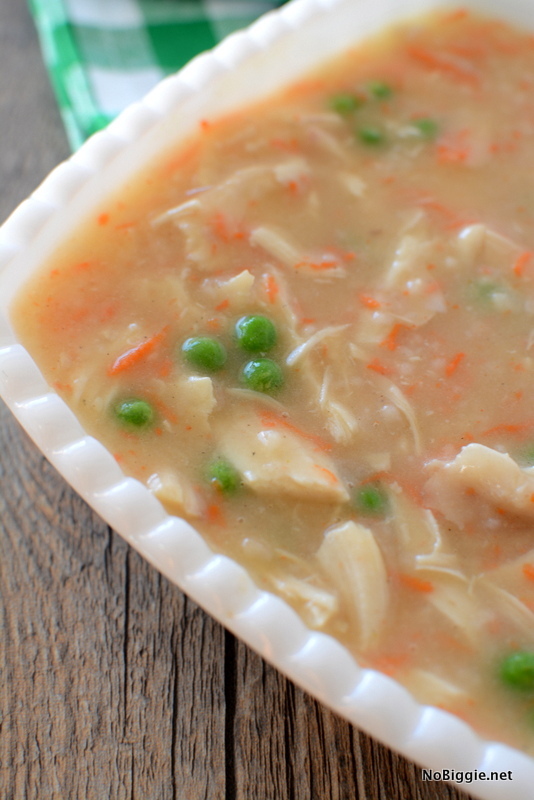 You can find the first two here: chicken wild rice soup and chicken noodle soup. This recipe is different from the other two and pure comfort food. We recently had a family night where we each brought a different soup to the gathering and I brought this one and everyone loved it so much. It’s a family favorite. I love to use my rice steamer for the rice for this recipe. I LOVE my rice cooker/steamer. I can’t believe I lived without one for so long! The rice comes out perfect every time. Here’s a good one if you are in the market for a good rice steamer. I also love to use rotisserie chicken for this recipe too. Sometimes I’ll buy two rotisserie chickens and I’ll shred all the chicken at once and freeze most of it. It always comes in handy for recipes like this that call for shredded chicken. Directions: Steam the rice (as directed on your rice steamer), shred the cooked chicken, peel the carrot and then grate the carrot. In a large stock pot add the butter and flour and make a roux. Continue stirring the flour in the hot pan with the butter until the flour and butter creates a brown paste. Add the chicken stock, salt, pepper and chicken soup base. Stir and cook for 30 minutes until well combined. 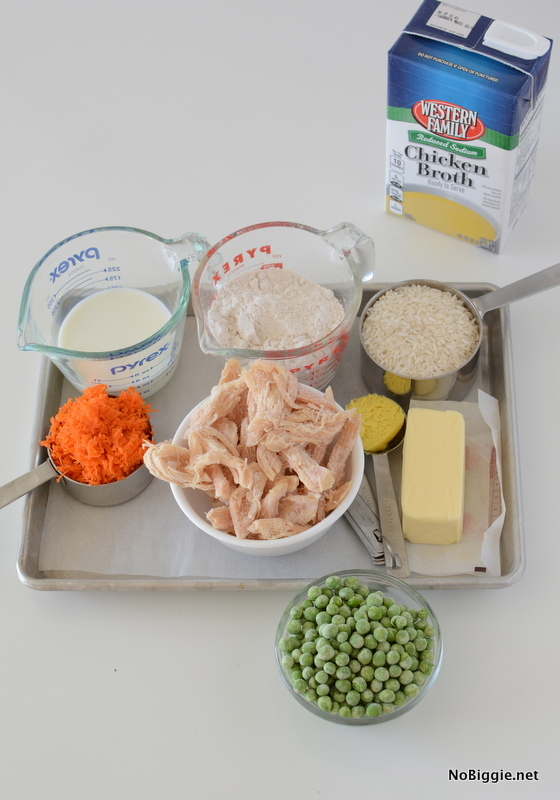 Add in the cooked shredded chicken, steamed rice, frozen peas and grated carrot. Finish by adding the cream or milk. Serve warm with hot breadsticks. You’ll have to try this recipe, your whole family will love it! 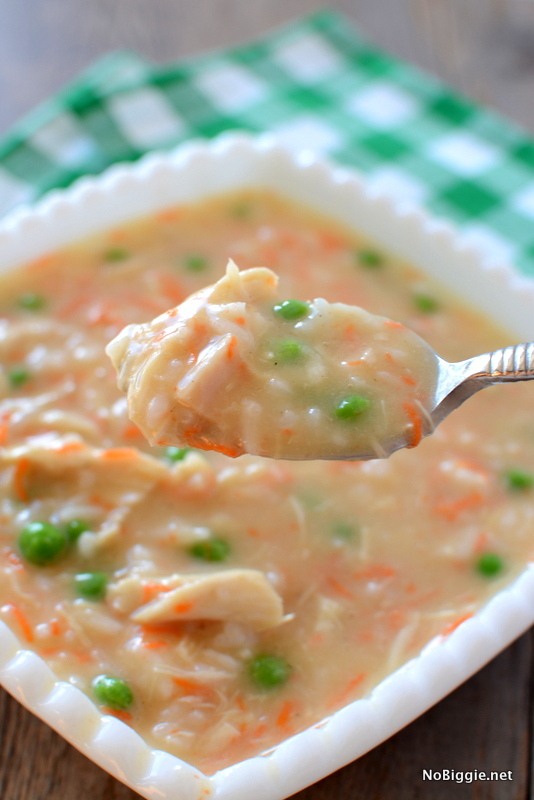 Do you have a favorite chicken soup recipe? Perfect day for soup! I wish I had some right now. Absolutely delicious! This recipe is worthy trying. It has a rich flavor and is healthy!